The Boss will probably kill me for this. Ha! So you’d better not tell him. a sudden, unexpected hospital appointment (Midi Minx follow-up appointment for hearing; it’s still bad; she’s to get grommets after all; whilst relieved at action being taken, I shall be investigating the grommets-that-never-were last November further…). him doing most of the cooking – yum! It’s not every man who’s confident enough in his own skin to wear his little girl in a bright pink wrap in public, but I’m very proud to say that The Boss is. Mini snuggled into the back of his neck and had a snooze as he marched up the hill. I don’t know which of the 3 of us enjoyed the experience more! *I’m delighted at the news that Midi will have the same excellent teachers for her first year that Maxi had this year. Talk in the playground is that Maxi’s teacher next year, whilst newly-appointed, is a much-loved brilliant teacher who was here a few years ago. What a relief! 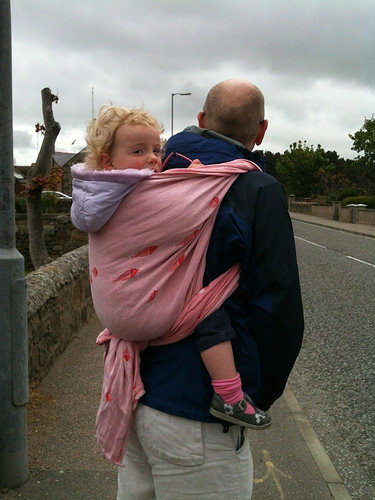 This entry was posted in Uncategorized and tagged Babywearing, holiday, slings, wraps by GrumpyOldTrout. Bookmark the permalink.